A great question, and I do understand the reasons why most photographers remain undecided about using email marketing in their business. But, despite the mad rise of social media, the simple photography newsletter—emailed to the folks on your list on a regular schedule—remains one of the most effective ways to cultivate and maintain great client relationships. And it’s those all-important relationships that ultimately lead to bookings, sales, word of mouth, and even repeat business. Email just happens to be one of the most personalized ways to keep such relationships alive because it feels more intimate. There’s a stronger 1-to-1 feel to a well-written email, even if you send out the same one to hundreds of people at the same time as a photography newsletter. But, as with any other marketing strategy, you must know how to approach email marketing correctly, starting with the core reasons of why it’s so important and powerful. 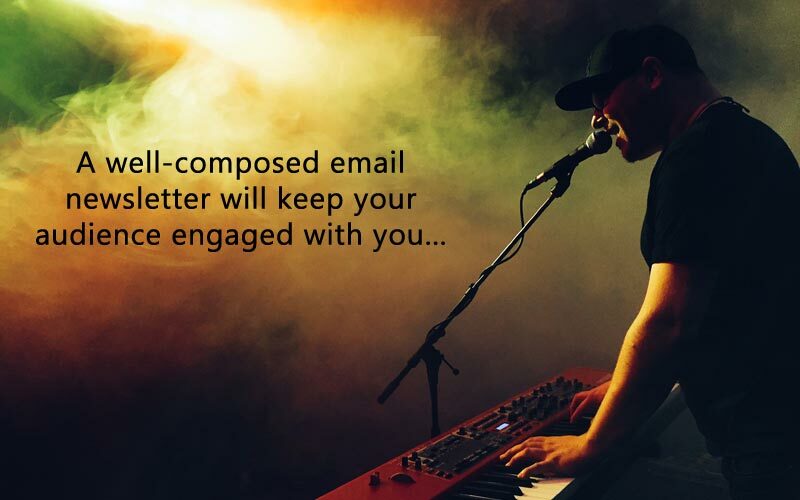 Sadly, too few professional photographers use email marketing effectively (if at all) to build solid client relationships, and improve the profitability of their business. Is an email marketing strategy missing from your marketing plan? Have you put off starting a regular photography newsletter because you’re unsure about why you should? If so, the 8 tips in this article will help you see the potential and put you on the path to building rewarding relationships with your clients. Don’t Let Your Clients Forget You! If you already send out a monthly email photography newsletter then kudos to you—this is a great way to “touch” your existing clients and new prospects on a regular basis that keeps your photography business and your brand on their radar. Keeping yourself positioned at the forefront of your clients’ minds is critical because we all know how easily life gets in the way, meaning they can easily forget you exist. But you do need to put people in front of your camera, right? In order to get those people where you want them to be, you must first earn their attention. Not only that, you have to keep their attention once you have it. Therefore, if you’re not sending out a photography newsletter, people will simply forget you exist and they’ll pick someone else when it’s time to actually find a photographer. Are You A Small Fish In A Big Pond? Before I decided to use email marketing in my own business, I (like so many others) mistakenly expected Facebook, Twitter and my blog to do all the work that a newsletter should do. After all, it’s no big task to write a short blog entry to announce a new series of portrait sessions or a special offer. Posting an update on Facebook or Twitter is easier still, and more fun than writing a photography newsletter, which sounded a little too much like being a journalist. The problem with this approach (apart from being lazy) is that your Facebook friends and Twitter followers are not paying as much attention to you as you would like—assuming they’re actually seeing any of your updates in the first place. 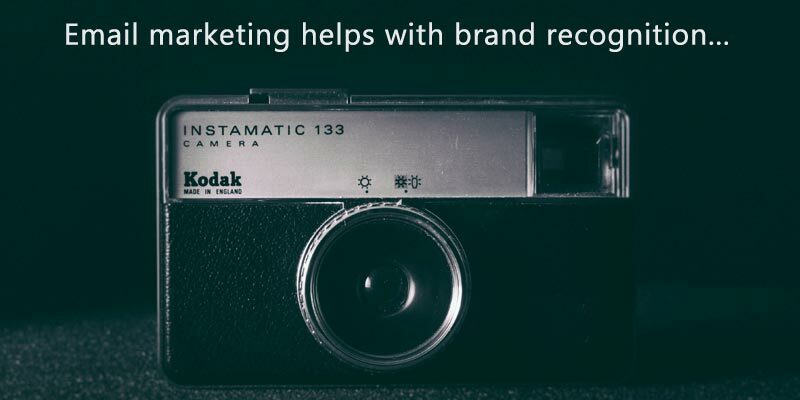 This is where email marketing and your regular photography newsletters come to the rescue. The world is full of distractions—Facebook updates, text messages, tweets, random YouTube videos, telephone calls, TV, radio, questions and interruptions, ads, and a myriad other things. It’s no wonder that we have a hard time attracting anyone’s attention for more than a moment or two. One of the few things we do have left in our arsenal that can effectively capture someone’s attention is the good old email or newsletter. When one of your subscribers opens your newsletter, they’re focused purely on that one thing (or at least as much as we can hope for in today’s age). They’ll scan it for interesting headlines, just like you probably did with this article, and perhaps a story on the benefits of wall portraits might catch their eye, which they’ll read in more detail. Even if they don’t click any of the links, the amount of time they spend reading your photography newsletter is enormous compared to a tweet. The benefit of concentrating your marketing information in a newsletter is that there’s a better chance the reader will actually pay attention to what you’re saying. For example, they might read that interesting piece you wrote about your unique emotional approach to wedding photography and how they can get the same level of service for their wedding. In essence, your overall message becomes “stickier” when presented in a concentrated and focused way like this, so the readers are more likely to remember it later. First and foremost, you’re a professional photographer, with emphasis on the word “professional”. In order to maintain that status, it’s imperative to always portray that same ideal to your clients and prospects. A social media update, or a blog entry, can be written in a very conversational, loose, or colloquial manner, without coming across as unprofessional. But, at the same time, they’re not the ideal vehicles to talk to your clients in more personal ways, while maintaining an almost intimate relationship. This is where the power of email marketing comes into play. A properly written photography newsletter can seem more immediate and personal, and just looks more professional. This is one of the biggest factors that can set you apart from your competitors, giving you the advantage you need. 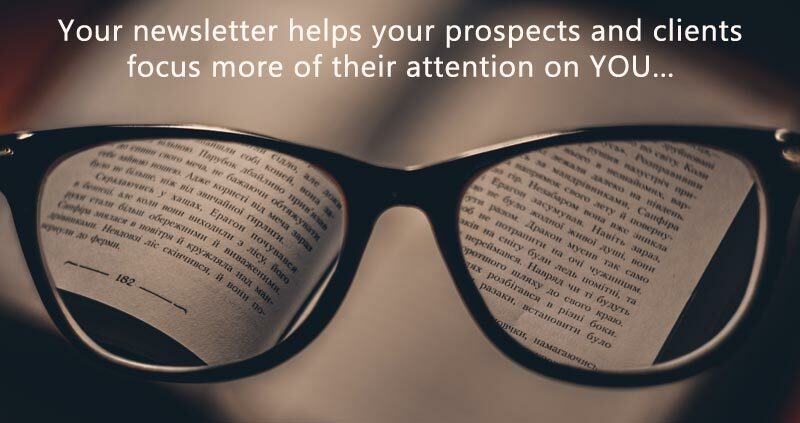 When presented with a newsletter that appears polished, clean and professional, your reader will take a lot more notice of what you have to say. In addition, a professional-looking email newsletter adds credibility to you and your business, creates a better relationship with your clients, and gives you more authority in your field. Inadequate engagement with the audience is a big problem with those types of marketing. Social media has made some small advances in this area. However, by its fast and furious nature, social media can only go so far in creating the level of personal engagement you need for an effective marketing campaign. As long as it’s written correctly, a photography newsletter will be more engaging to your clients and will be much more effective than a barrage of status updates and tweets. If you’re consistent (which is extremely important) and send them out on time, you’ll find that your readers become more engaged as time goes by, and will even look forward to receiving your email. Consistency is a big factor too—you must stick with it and keep going, despite any temptation to slow down or quit. You’ll find it exciting to send out the first one or two, but then it gets more difficult as it becomes a regular chore, or you start to run out of ideas, and you might even feel despondent when you see a poor response after the third or fourth one. But don’t give up. I guarantee that people are reading them and if you show that you’re in it for the long haul, you will get responses. Engaged clients, people who enjoy reading your photography newsletter, may also be more likely to pay attention to your other forms of marketing, such as Facebook posts, tweets etc. This is one of the huge benefits of marketing yourself through multiple channels—your name becomes more familiar and you start to become noticed and wanted. Trust is the big elephant in the room that no one wants to talk about, because it affects us on deeply personal levels, and can be uncomfortable to deal with. We all want to be liked and trusted, but it can be hard to earn. 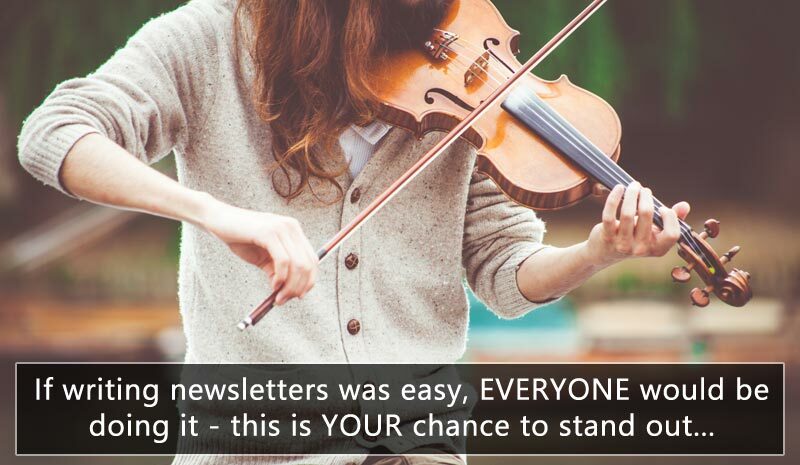 A good newsletter, written from an honest and genuine perspective, both educates and entertains your reader, developing and augmenting their trust in you and therefore your brand. Increased trust leads naturally to repeat business and brand loyalty. It’s quite simple: If your clients trust you, they will buy from you again, and they will also refer you to others. Communicating with them regularly through your email marketing continuously builds upon that trust. Before you can think about brand loyalty, you need to first build a brand that people will resonate with and recognize. Brand recognition is concerned more with how people perceive you and your business, and how easily they recognize you or your work. What makes people recognize your photography business? It could be your style of photography, how you communicate your personality, your personal story and why you do what you do, the colors and fonts you use in your marketing, the type of finished product you specialize in, and your logo. All of these elements should be consistent across your whole business—including your photography website, business cards, stationery, and your photography newsletter. By bringing your email marketing format into line with everything else, you’re reinforcing your brand and improving its recognition. 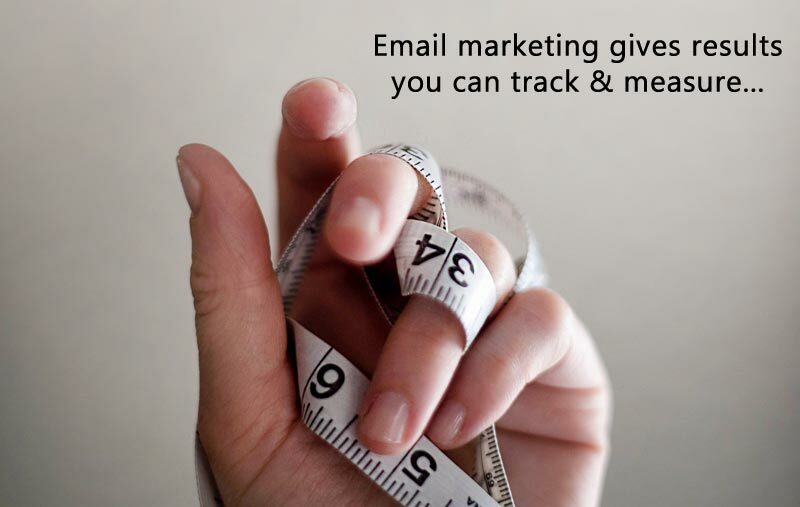 Email marketing service providers (I use ActiveCampaign and love their service) are dedicated to making sure your emails get through, they provide detailed analytical metrics, and can ensure that you stay on the right side of the anti-spam regulations. The cost is minimal and well worth it, and they even provide a wealth of templates with which to build your photography newsletters (although I personally prefer to text-only in an HTML format). One of the really great features is the ability to have HTML and text versions of your photography newsletters to ensure the widest possible audience. These metrics are invaluable as clues to how your clients are behaving and the kind of things they might respond to, allowing you to fine tune future mailings. For example, you can see exactly who clicked the link to a specific promotion and then further target those people with a more focused message. Alternatively, you can target those who failed to respond the first time with a different email message. One of the reasons why you’ve put this off for so long is because you thought that writing lots of emails is difficult. Now, you find that this turns out to be one of the best reasons to start! I know it may not sound like a great reason to write a photography newsletter, but bear with me here. We already know that most professional photographers are not sending out regular newsletters to their email list. Some start out boldly, but then stop after a couple of issues because they either get discouraged at the lack of immediate results, or find that it’s harder to write than they first thought. Others don’t even keep a list of their clients’ email addresses. Oddly enough, this is great news for the rest of you. Being successful in business is anything but normal, nor is it easy. If writing a newsletter was that easy, everyone would do it, and then it might not be as effective. Instead, if you force yourself to tackle the task and get it done as professionally as possible, I believe there are great rewards to be had. Yes, it takes time to write and format emails. Yes, it takes effort to think up articles. Yes, it takes a concentration of will to force ourselves to think creatively and not produce a newsletter that’s just a sales letter (see #8). But, it is wholly worth it in an effort to separate yourself from the pack. How do you feel when friends or family lose touch with you? Perhaps they haven’t called or emailed you in a long time, and you’re starting to think they’ve forgotten about you. What about a business you loved dealing with? All of a sudden, because you bought something from them, they stopped communicating with you, making you feel like just another faceless sales receipt. The last reason on this list (but I’m sure there are many more) is that your clients really do want to hear from you! 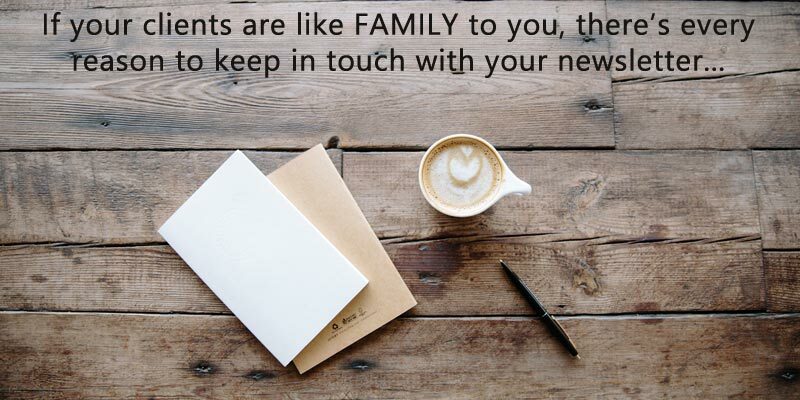 They even want to get to know you personally a little more, find out what’s happening in your business and, more importantly, it makes them feel more appreciated. If you don’t communicate with them then it’s as if you originally sold them a portrait or wedding collection by appealing to their emotions, and now want nothing more to do with them! That’s going to sting, no matter how you look at it, and could negatively impact any word of mouth marketing you might have gotten. Therefore, to keep the relationship alive and kicking, it’s important for your newsletters to be fresh, infused with your personality, and interesting to read. Follow that rule and your readership should grow nicely over time and your business will start to see positive results. Just don’t expect it to be an overnight success—it does take time. As alluded to in #7 above, one thing I will say is that your newsletter should NOT always be a sales letter. Don’t make the terrible mistake of thinking that a sale, monthly offer, or promotion all by itself is a newsletter. Your readers will soon grow tired of receiving nothing but sales information and will quickly unsubscribe from reading it, leading to a damaged brand. This last point can be a challenge for even the most advanced email marketer, but it is important nonetheless. If you’re still unsure about how email marketing and a regular photography newsletter can help build better relationships with your prospects and clients, here’s a great video with some tips from marketing expert Ian Brodie. Ian Brodie is also the author of a brilliant book on email marketing called Email Persuasion, which I highly recommend you read.